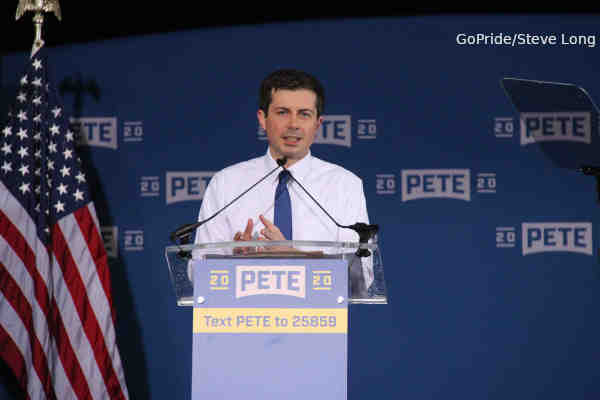 Pete Buttigieg, the openly gay mayor of South Bend, Indiana, on Sunday made his 2020 presidential campaign official. The crowd applauded, chanted “U-S-A! U-S-A! U-S-A!” and waved American flags. In January, Buttigieg announced he had formed an exploratory committee for a possible White House run. Without mentioning President Donald Trump's name, Buttigieg targeted the president's “Make America Great Again” slogan. Buttigieg's announcement comes on the heels of two polls showing him in third place behind former Vice President Joe Biden and Vermont Senator Bernie Sanders for the Democratic presidential nomination. “There are enormous minefields and hurdles to running as an openly LGBTQ candidate, and so far, Mayor Pete has gracefully leaped over them on the world's largest political stage. He's the real deal,” she told the Washington Blade. Buttigieg's husband, Chasten, joined him on the stage after he concluded his speech. The couple shared a quick smooch and an embrace as the crowd cheered.